Centrifugal Fans & Blowers | AirPro Fan & Blower Co.
What is a Centrifugal Fan & How Does it Work? Centrifugal fans (centrifugal blowers) are a common type of fan used in consumer and industrial products to move air or other gases. A centrifugal fan consists of three main components: a motor, a fan blade, and an enclosure. Our application engineers design all of these components to accommodate an application. Some common design criteria are the size of the motor, the shape of the fan blade, the direction of rotation, and the materials of construction. The rotating fan blade creates a low-pressure area at the center of the blade and a high-pressure area at the edges of the blade. It also adds kinetic energy to the air. The low-pressure area at the center of the fan creates a vacuum that draws air into the fan. The air flows from the center of the fan to the outside edges of the fan. Ultimately, it flows out of the enclosure around the impeller in the desired direction. The design of the overall system accounts for the 90-degree turn in the flow path. Below is an example showing a Backward Inclined Fan with accessories. Centrifugal fans come in a variety of designs. 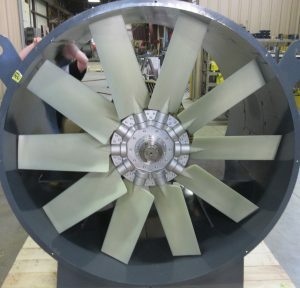 Several components, including the type of fan blade used, the design of the enclosure (housing), and the materials of construction, determine the complete fan design. Industrial centrifugal fans and blowers accommodate a variety of applications. For example, chemical processing, corrosive gas handling, dust collection, dryers, fume control, process cooling, and process heating. Below are some of the most common, with links to more information and related fan designs. Industrial fans need to meet a specific set of design criteria. We recommend working with an AirPro fan selection expert to design the best fan for your application. You will be working with industry-leading fan engineers to create customizable solutions to match your project requirements and budgets. 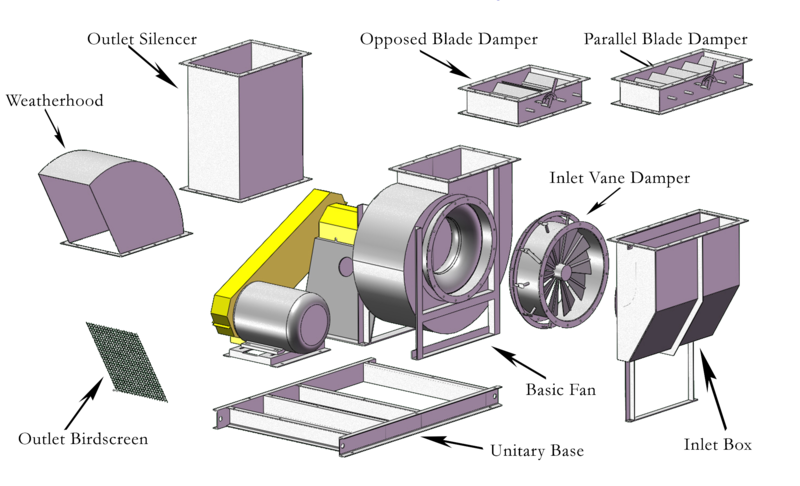 To view a full list of centrifugal fan applications, click here. Safety and reliability are key areas of importance, and we guarantee our quality. AirPro inspects, tests, and engineers its industrial centrifugal fans to meet the highest levels of quality and safety. AWS standard certification and Quality Control documentation accompany every shipment. Our products are also CE Certified and ATEX rated. Proper maintenance is critical to the successful operation and long fan life. In every possible case, our centrifugal fans contain features that make routine maintenance easy. To accommodate gases or materials in the airstream, add protection and increase the life of the blowers, we add special finishes including industrial enamel, specialty paints, powder coating, and custom linings. Industrial environments commonly use centrifugal fans and axial fans, but they have very different performance characteristics. Axial fans serve applications requiring a large flow rate with a minimal drop in pressure. Axial fans pass air straight through the blades instead of creating a 90-degree turn in the direction of flow. If there is not a large pressure drop in the application, the axial fan can be preferable due to form, fit, & function. Field erected cooling towers often utilized in industrial processes and in power generation facilities. Package cooling towers which are mainly used in HVAC applications. Air-cooled condensers which are a critical component in power plants and typically utilize large diameter fans. Air-cooled heat exchangers (ACHE), primarily for process industries (petrochemical, oil refining, and gas compression). 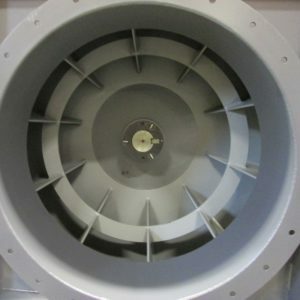 Centrifugal fans typically work in areas of little to no natural ventilation and are attached to a duct system, making them ideal for larger spaces. When deciding which style of fan to use, you may want to consult an expert. AirPro application engineers will be able to examine your performance and installation requirements to assist you in determining which type of fan is most ideal for your specific application.